Owners or trainers of Inglis graduates who are interested in competing in the 2019 The Everest are encouraged to express their interest in the near future by contacting Inglis Managing Director Mark Webster on mark@inglis.com.au or 0419 610 809. Priority will be given to Inglis graduates that have paid up for an Inglis Race Series, past or present. “We feel we had the right horse last year in Santa Ana Lane (pictured), an $80,000 Melbourne Premier Yearling Sale graduate but the late heavy rain put an end to his chances. 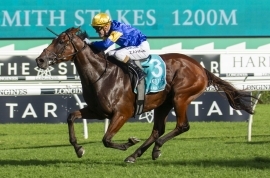 “We saw in the TJ Smith Stakes on the weekend that Santa is still up there in the upper echelon of sprinters in the country but there are a lot of quality candidates for this year’s Everest from Australia and around the world. Expressions of interest close at 5pm on Tuesday April 30th 2019. All expressions of interest are to be made in writing to Inglis’ General Manager of Bloodstock Sales Sebastian Hutch at sebastian.hutch@inglis.com.au.